FRIDAY, MARCH 2 – 8:30 a.m. The proposal from Pres Schill and VPFA Moffitt includes two “differential tuition” components. One is a $20 per credit add-on for business school classes. This was brought to the “Tuition and Fee Advisory Board” by the B-school dean, and their report here includes extensive discussion (page 4 and 5) of the pros and cons. The increase will reduce the need for increases in tuition for other UO students. The business school commits to use 20% of the new fees to reduce tuition for their low income students. The second proposal is for a cut to tuition for Honors College students. This proposal will increase the need for tuition increases for other students. This cut is not tied to income, or merit. The cut was not brought to the TFAB. Instead it was approved on the side, at a meeting of the Budget Advisory Group after a brief presentation by VP Brad Shelton. Not exactly transparent. At UO discounts (scholarships) for low income and high ability students average 10% of the listed tuition. Our comparators average discounts of about 20%. 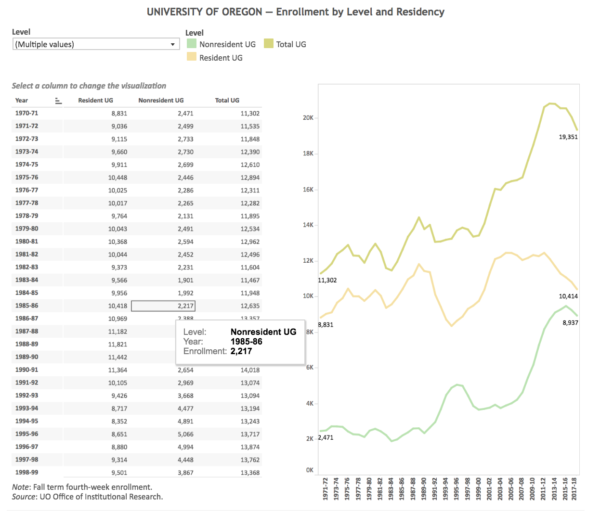 This difference is part of the reason why UO’s enrollment is falling and why we are doing such a bad job enrolling low income students relative to our peers. The Honors College tuition cuts will make this problem worse. I’ll try to live-blog some of this, and I’ll be there for the public comments Friday, but there are limits on how much of this stuff I can take. Their website makes it as hard as possible to figure out what is going on, so here are the agendas for the committees and the BOT, with links to the meeting materials. Looks like a snoozer to me, but if you see something, say something. As usual Jamie Moffitt does not show the Trustees any substantive data on UO’s budgetary decisions such as how much goes to athletics, the various colleges, etc. No mention of the centralization of resources which is causing College of Ed dissension. No discussion of the increasing proportion of resources going to the central administration at the cost of the College of Arts and Sciences. No discussion of the continuing subsidies for the law school and (rumor has it) the College of Design. 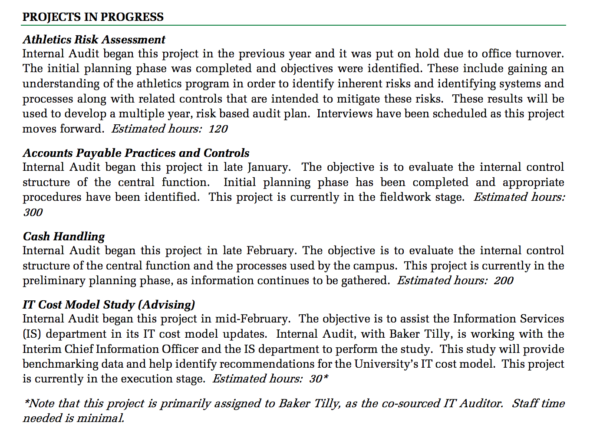 The Executive and Audit Committee materials do not include Internal Auditor Trisha Burnett’s report, and when the Trustees do get to see the report, at the meeting, it will avoid any specifics that might alert them to problems or lead them to ask tough questions or allow them to do their due diligence. There are, however, shiny powerpoints from the Chief Resilience Officer and the Chief of Police, complete with photos of the new dog. Public Meeting | March 1, 2018, 9:00 a.m.
Banavar: No worries, all is well. No questions from the board. Chronister: No worries, all is well. No questions from the BOT. Endorsed unanimously. Pratt: No worries, all is excellent and we’re making it more excellent. Dawson: Fact based research on how to do more excellent teaching. Starts by asking the BOT to recall some excellent teaching they were exposed to. Trustees seem to be enjoying this. Rumbarger advocates for using specifics to talk about teaching excellence. Read the packet, I can’t type that fast. Many specific examples of how the TEP is promoting simple practices that improve teaching. Dawson explains more about how AAU is now emphasizing teaching improvements, need for better student feedback and teaching evaluation procedures. Pratt explains need for better evaluation, more emphasis on using the Teaching Excellence Program to improve faculty teaching. Some good questions from the trustees. The Trustees are asking some excellent and skeptical questions of Kerr, regarding the survey and what it means. Sorry, I’ve got to leave. Ford did a good job presenting this to the Senate yesterday. Public Meeting | March 1, 2018, 1:15 p.m. Sorry, I missed this meeting. I’m sure it was a thorough 45 minutes. Public Meeting | March 1, 2018, 2:00 p.m.
And here it is, shown to the Trustees just before the meeting: http://uomatters.com/wp-content/uploads/2018/03/Q3-EAC-Quarterly-Report.pdf Three pages. How can the Executive and Audit Committee do its due diligence like this? Chuck Lillis: Trisha is doing a great job telling me things in closed meetings. Ross Kari: Some evidence of improvements in past deficiencies. Peter Bragdon: How have you tried to market the hotline? A little. No mention of departure of Auditor Stephanie McGee, for a better job at another university. 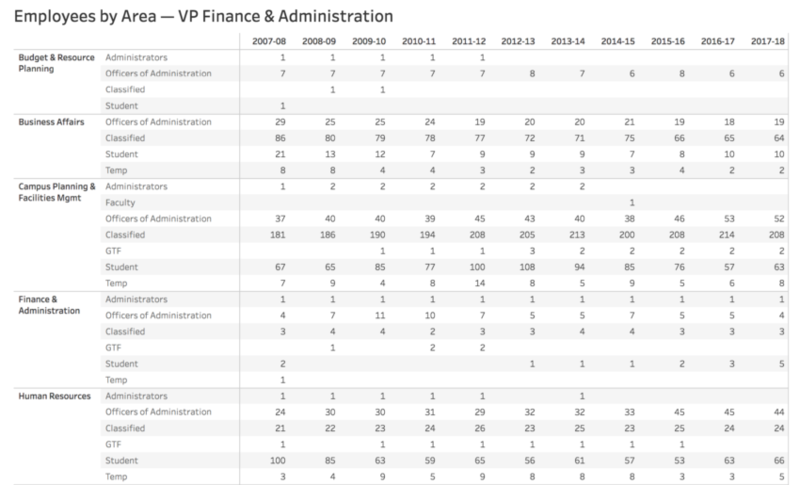 Lots of turnover – never a good sign in an internal audit department. Connie Ballmer: Why is your office dealing with things like enrollment and academic quality? Le Duc: It’s all about protecting the brand. My office needs to monitor and proactively manage everything. 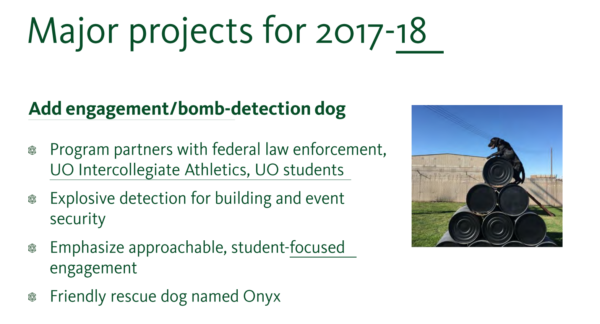 Carmichael and his three students have many other good things to report, including more student shuttle services (started by ASUO, now managed by UOPD at their request) and bringing the UOPD back on campus, by putting a substation in Onyx Bridge. At-large positions on the governing board are volunteer posts with nominees selected by the governor. The governor will submit her choice to the Oregon Senate, which in turn votes on whether to confirm nominees. Those interested in applying should contact University Secretary Angela Wilhelms, who can provide more detail on executive appointment processes and deadlines. She can be reached at wilhelms@uoregon.edu or 541-346-5561. Perhaps Governor Brown will use this opportunity to appoint someone to the Board who knows something about higher education. Passes unanimously with no discussion. This is the Dec 7 committee meetings. Dec 8th board meeting is above. Update: I’ll fix these links and add some live-blogging during the meetings today and tomorrow. They scheduled their last meeting during summer break, to coincide with a Duck football game. So I suppose this is a D+ if we grade them on improvement. Their website is hard to navigate, so here are the links and some additional info. All meetings will be in the Ford Alumni Center, Giustina Ballroom. This starts of with usual pablum about 24/7 academic excellence. At least the Board has stopped using the Ducks as an example of how us faculty and staff can achieve it. I’m a little unclear on what the learning objectives are for this section. Maybe there will be some iclicker questions for the board at the end, to check comprehension. Senate Pres Chris Sinclair lays out one possible proposal for Gen-Ed reform. Hope is to have a more structured first-year program, with students taking set of courses in related subjects, while living in dorms with other students interested in the same matters. Helps with retention, so on. Some changes to how we organize the multicultural requirement, since the buzzwords have changed – “tolerance” is out, for example. LCB Dean Sarah Nutter: As working on expanding business ARCs. Goal is employment ready, globally connected graduates. Board Chair Chuck Lillis asks how we know students are learning something in writing classes. Notes that some universities keep a record of all student papers, and compare progression over their education. This is the best idea I’ve ever heard from him. Connie Ballmer asks about the timeline, notes it’s an ambitious project. Who is in charge – Provost or Senate. Pratt and Sinclair: We both are. Her follow up is on metrics. Sinclair: Task Force. Ginevra Ralph asks about sexual assault training, which students talked about last year. Also asks Senate to make sure the requirements are flexible enough for non-traditional students. Ann Curry applauds fact program is flexible, provides a liberal education. I’ve been listening to UO administrators talk about doing something online since Jim Bean. This ship has sailed. Pratt notes that while Bean bloviated, OSU acted, and now dominates online in the state. Now it’s going to be tough for UO to do more than fill in some gaps. Good reasons to build some more on-line anyway, even if only for our own students. So we’re going to throw some money and time at this. Step one will be to hire a Vice Provost, to hire some Assistant Vice Provosts. The trustees are slowing realizing that UO is never going to make money at this, but we will help our students graduate more quickly. 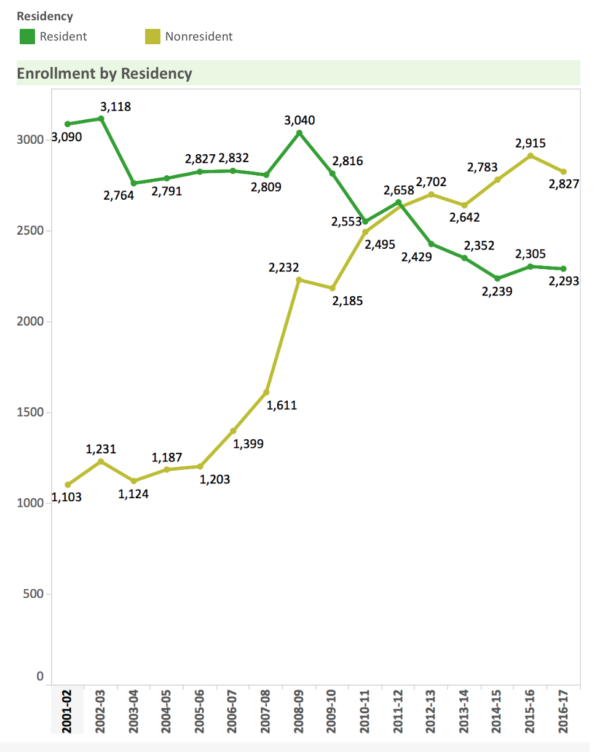 Undergrad minority enrollment has nearly doubled since 2005 to 27%, but the percentage of low-income Pell grant eligible students peaked at 26% in 2011, and has fallen slightly since. 8/7/2017: UO is failing on economic diversity. Where’s the “Economic Diversity Action Plan”? 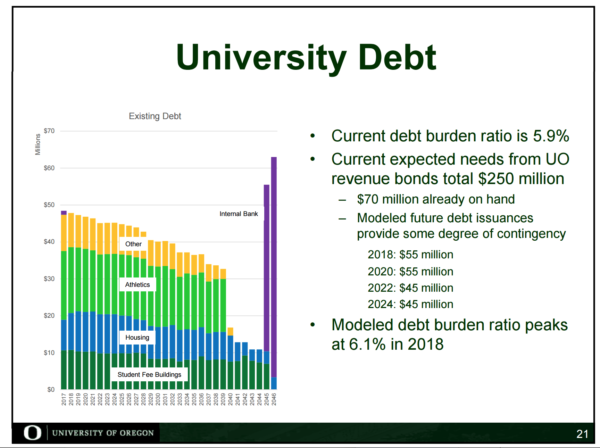 Brooks also reports that federal law will mean a $3.2M reduction in federal aid for UO students. Trustees ask some questions, this isn’t as drastic as it sounds. The Audit Report will not be provided until the meeting, because we wouldn’t want the Trustees to have time to do their due diligence. Say, I wonder what happened to the results from their audit of the athletic department? Whatever’s going on with UO Audits, the Trustees are never going to learn about it. Unbelievable. No substantive questions from the trustees as might be expected given that there is so little detail presented. 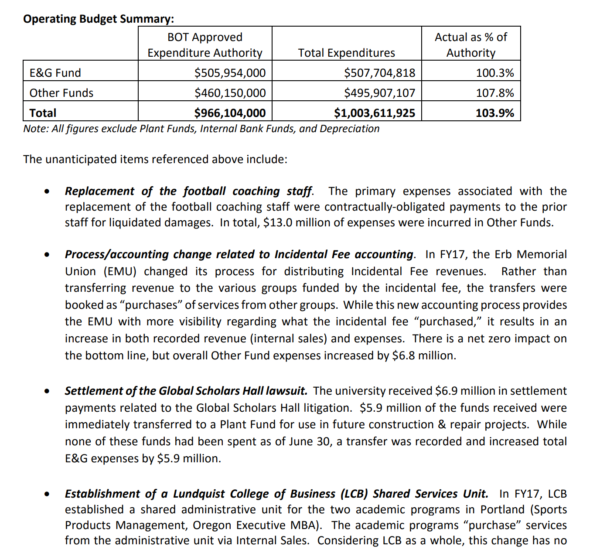 Still no breakout of the athletic department budget – the $13.7M to buyout Helfrich is hidden in here somewhere, as is the millions in subsidies from the academic side. 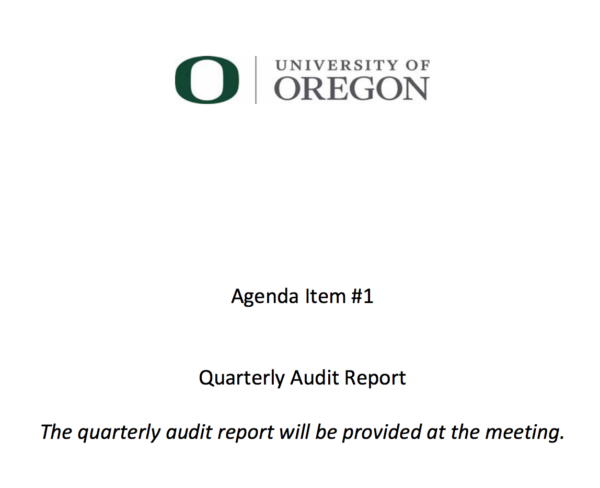 The external auditor presents UO with a “clean audit letter”, gets gushy about how great UO’s team is. Gosh, it’s almost like he wants to keep the UO contract. 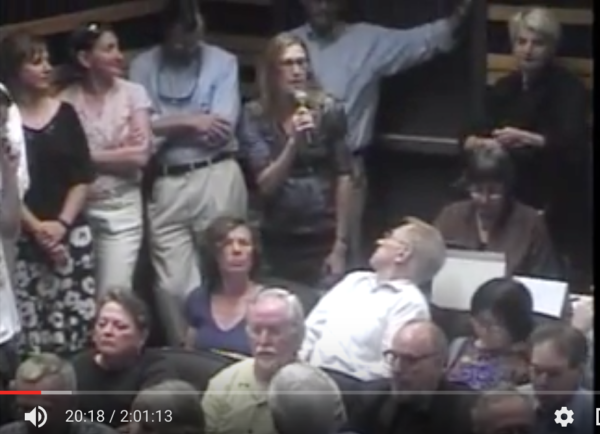 Chuck Lillis – a man who has some experience with inadequate external audits and lawsuits against Board members – rather pointedly asks him if there is a rule requiring UO to switch auditors every few years – as is true for publicly traded corporations. Turns out there’s not. Nor does Moss Adams have an internal rule requiring that their employees rotate – to avoid too much coziness with the clients. 2. 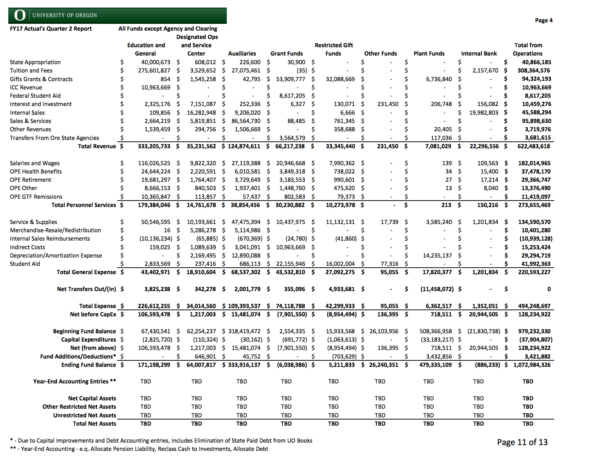 Quarterly Financial Reports: Jamie Moffitt. As is true every year, Moffitt tells the board we are “run rate even” – despite drop in tuition revenue, international students, increase in pension costs, etc. More state revenue, more grants, etc. The PLC faculty are going to die there and rot in its ruins. Meanwhile they’ve added another floor to the new Tykeson building – but not for faculty. Whoops, my bad. The above was the agenda for OSU Trustees committee meeting in October, not for the upcoming meeting of the UO Trustees committee, this Thursday. I think their previous meeting lasted about 40 minutes. More on the UO Board meetings for Dec 7 & 8 here. This idea has been kicking around for a few years, and was most recently presented to the Trustees at their Nebraska game home meeting. Saul Hubbard has an extensive story with many quotes in the RG here. 9/20/2017: Around the O has the puff piece here, from PR flack Tobin Klinger. 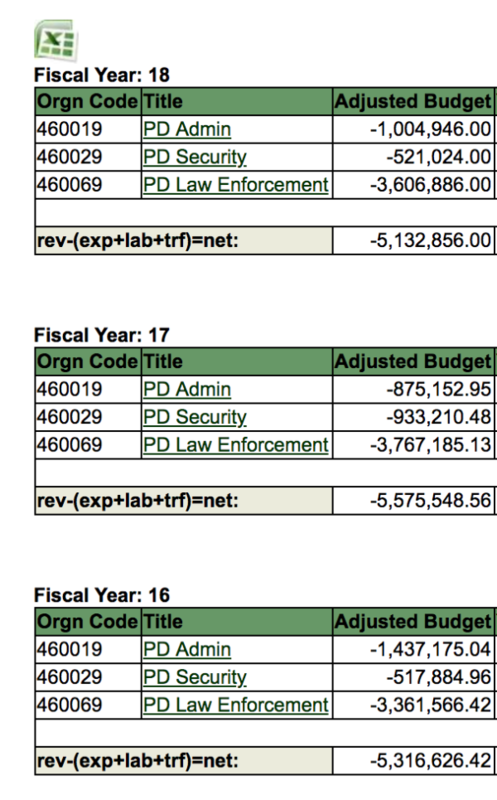 You’d think UO’s $475K budget for “Executive Communications” would buy a few more facts – maybe even a link to the letters from the Senate and Union, which McIntyre got by making a public records request to the Governor? Or at least something about how Prof McIntyre’s research is financially supported by a donation from at least one of the UO trustees, which may present some interesting potential conflicts of interest. [9/21/2017 correction: I’ve been informed by a generally reliable source that McIntyre’s research is not supported by donations from trustees.] She has of course agreed to follow Oregon law on conflicts of interest, which is not particularly strong. McIntyre follows Trustee Susan Gary from the Law School, who served two terms during which she refused to inform the faculty of such matters as Chuck Lillis’s Delegation of Authority power grab. We’d probably be better off abolishing the Faculty Trustee position than continuing to help the Trustees believe that they are getting the faculty’s point of view on UO issues through these sorts of appointments. – President Schill gives his definition of excellence in his remarks below. – Biology Prof Karen Guillemin gives a fascinating talk on the importance of bacterial diversity. My takeaway is the same as Ginevra Ralph’s: Mom was wrong when she told my little brother to stop eating dirt, but the research is still inconclusive on whether he should start again at age 53. BOARD MEETING FRIDAY, SEPTEMBER 8 – 8:30 a.m. Link to materials. –University Senate President Chris Sinclair: Focuses on the Senate agenda for this year: Repeal and replace course evaluations, start fixing Gen Ed and multicultural, work to extend the principles of the new sexual assault and harassment policy to racial harassment and discrimination, all underway with the cooperation of JH. –Provost Jayanth Banavar: Gives a shout out to the UO staff and OA’s, without whom “there would be no show.” Advocates for transparency, when possible, a nimble flexible administration, and shared governance where everyone can be proud of the UO. Calls for “selective excellence” (hey, at least that’s got a little more substance than “excellence”). 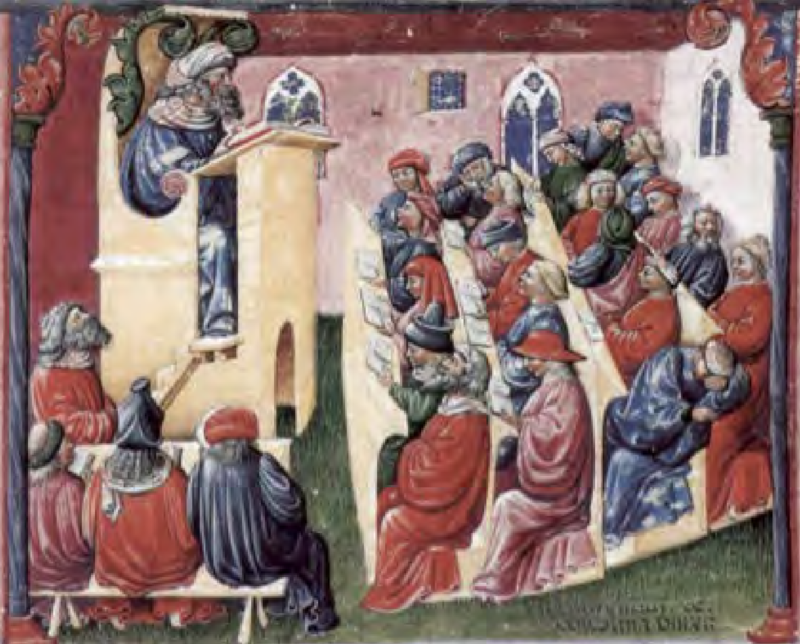 Warns about the difficulty of retaining top faculty. Argues for a balanced curriculum of sciences, arts, and social sciences, to teach the knowledge people need to be good citizens, productive, and understand the world and ourselves. Gives as examples of selective excellence the hiring of Nobel Laureate David Weinstein, the efforts of Doneka Scott and Ron Bramhall on UO student success, etc. Goals for the Provost: Institutional Hiring Plan – open and objective process for faculty searches. 62 faculty searches this year. We need to know what is excellence to do this well. Plans to learn this from talking to the current faculty. Students are paramount and their success is a priority. Q from Schill on ALT meeting. Banavar notes he invited Senate leadership to this, a first. Lots of talk on academic entreprenurship. Excited about working with the Senate on academic matters as generally understood, and also Economic Diversity. Fundraising update to be announced later. [Obviously with Phil Knight’s gift it will be a lot.] UO has strongly supported DACA/Dreamers, calls notion that we would send these students back “crazy”. Notes that he rarely gives his political views and thinks statements on politics can violate the rights of the individuals who comprise it – but notes DACA is an academic matter. He’s been harassing Roger Thompson with texts about enrollment, and thinks we’ll have about 4K freshman plus 1.2K transfer students. 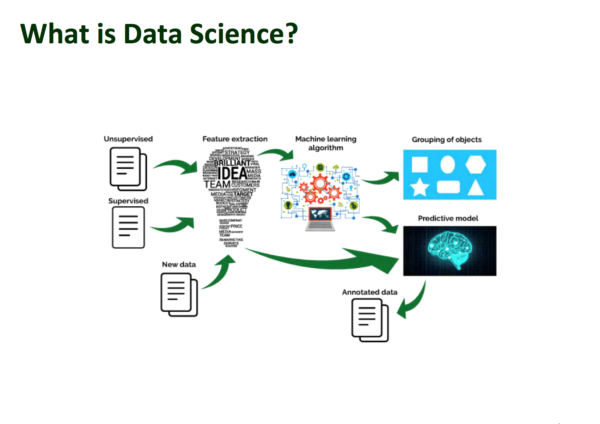 Talks about new data science initiative. All approved, discussion was in committees yesterday. Sorry, this is really interesting. I’m listening not blogging. In all fairness this looks to be a rehash of a discussion held back when Gottfredson was president, and presumably was just added for padding. Update: The board material has now been updated with some slides on this, here. – UO Tribal Liaison Jason Younkers gives an understated and moving explanation for why UO’s newest dorm will be named Kalapuya Ilihi, or “The place of the Kalapuya”, in recognition of the people whose land it sits on. If I understand it right they had no name for themselves except “the people”. The other tribes called them the Kalapuya. – Two and a half hours on Academic and Student Affairs, and they didn’t hear from a single professor or student. Fortunately the UO administrators in this area are now very good. – An astonishingly brief report from Internal Audit, with no materials distributed in advance, and no significant questions. This is not due diligence. The report is now posted here, towards the end. The gist is that they’ve spent the last year working on their strategic plan, mission statement, and a vision. – Knight Campus seems on track and well managed. – UO Foundation CIO Jay Namyet may occasionally write some nasty emails, but he, VPFA Moffitt, and Treasurer Karen Lavear do their homework and present it well. Yes I know I’ll regret writing this next time we do union bargaining. 9/6/2017: There will be a lot going on at UO this year – some of it key to our survival as a public R1 university – but apparently our administration doesn’t think the UO trustees need to hear about it, much less discuss or vote on it. Judging by the nonsense I’ve heard from this board, they may have a point. While board members say that they want to meet with students and faculty to learn about higher ed, this meeting as many others will be held while classes are not in session and many faculty are not on campus. But of course there will be football. Board Chair Chuck Lillis has scheduled a few hours of committee meetings Thursday, then a brief board meeting Friday AM. Saturday will be tailgating and the Nebraska game from the President’s $350K Autzen Skybox – still paid for with student tuition and state funds? I’m no economist, but I think the Generalized Axiom of Revealed Preference is about what people do, not about what they say. The public meetings will be in the Ford Alumni Center Giustina Ballroom. This post will be updated on the off chance anything happens to justify the cost of this meeting. Academic and Student Affairs Committee, 10:00 a.m. – Thursday, September 7, 2017. Link to materials. New Provost Jayanth Banavar opens with a good speech about making UO even more excellent than it currently is. The Board is letting presumptive Faculty Trustee and Gottfredson supporter Laura Lee McIntyre sit in until she is confirmed. Her research is financially supported by a donation from at least one of the trustees, which may present some interesting potential conflicts of interest. [9/21/2017 correction: I’ve been informed by a generally reliable source that McIntyre’s research is not supported by donations from trustees.] She has of course agreed to follow Oregon law on conflicts of interest, which is not particularly strong. This is sold as a retention measure, despite the endogeneity problem. The % of freshman on-campus will rise from 80% to 90%. There are a number of exemptions – notably including some athletes. Thompson and Griffel are very aware of the cost issue, and have addressed it with a budget meal plan. UO’s students – not known for economic diversity – want the fancier dorm rooms. From what I’ve seen Marbury, who was promoted after the abrupt departure of VP Robin Holmes, is a significant step up and seems to have cleaned up the DSL quite a bit over the past year. Good presentation. It won’t be a surprise to learn that UO’s frats are a cesspool of sexual harassment and assaults and low academic achievement (adjusting for parent SES). The DSL has had some consultants in, and has just hired Marcus Langford to clean it up and hire a new Director of FSL. Langford argues that minority fraternities and sororities can improve retention and outcomes and wants to increase their number at UO. Notes that most fraternities and sororities at UO currently are “historically white”. Notes that are “challenges”. Currently 4 suspended frats at UO. Talks a little about hazing. Wants to expand the office. At least some of these costs are paid by taxing the frats and sororities. Doesn’t mention the assaults. Q from Ginevra Ralph: I haven’t heard justification for this. It’s too much about how pretty you are or what color your skin. She knows girls who’ve dropped out of college because a sorority wouldn’t let them in. Why not have affinity houses instead, based on areas of shared interests? Kris Winter responds with some pablum. Schill notes that the greeks are good alumni. Langford says greeks have slightly better grades, slightly worse retention. Lillis asks about Academic Residential Communities in the dorms. UO has a small ARC program, which indeed should be grown. 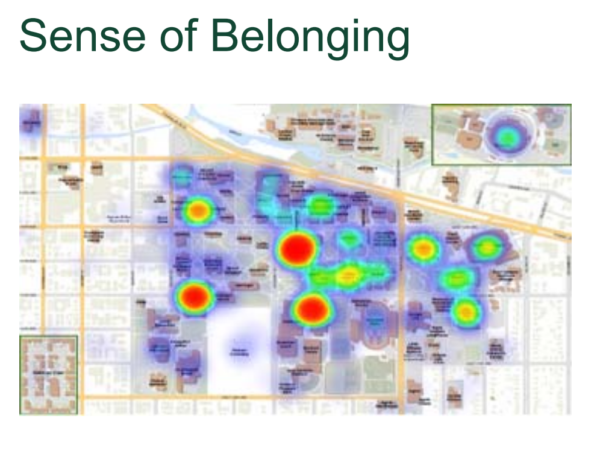 No one here has the guts to bring up the link between frats and sexual assaults, well documented in Jennifer Freyd’s UO campus climate survey, and many others. Imagine finding a bill for $200 in your mailbox because your daughter was late to a couple of sorority events. Imagine, too, that those who snitched were her new best friends. This is one of the unwelcome surprises of sorority membership. Now imagine attending mandatory weekend retreats, throwing yourself into charitable work, making gifts for your sisters and, at tradition-thick schools like the University of Alabama and University of Missouri, investing 30 to 40 hours pomping — threading tissue paper through chicken wire to create elaborate homecoming decorations or parade floats that outdo rivals’. Trustee Ginevra Ralph has it right: repeal and replace greek life. Unfortunately UO can’t afford to do that. A few hours ago Betsy DeVos announced that she was re-evaluating the Obama administration’s OCR guidance on how to deal with campus sexual assaults. If anyone sees a good analysis, please send me a link. Fortunately Darci Heroy has done an amazing job at UO since Title IX was split of from our dysfunctional AAEO office, and there’s no sign UO is going to back off its commitment to deal with the widespread problem of campus sexual assaults. She explains UO’s new student-directed reporting policy, tells the board that they are “designated reporters”, i.e. mandatory reporters for disclosures by students, while faculty and others can now have confidential discussions with (adult) students without having to tell the administration against their will. Trustees seem impressed too, Schill heaps praise on her, notes the collaboration between JH and the Senate, and say “most of us believe this is a good policy” and we should celebrate it and the shared governance process. Bramhall presents info on high DFW science courses and their impact on retention, explains plans to give more intensive advising to students in trouble. Cautions we don’t yet have the resources to do that. Q from Connie Ballmer: Remembers some courses as “weeder courses” that students would switch majors after failing. We’ve still got them too many students don’t switch, they drop out. College is a great investment, but only if you graduate. Lillis asks about parents’ role, Scott talks about programs she and Introduktion are cooperating on. Bramhall explains we’re also working to keep faculty in the loop. Ann Curry asks about problem of students no getting into classes they need. Bramhall notes we’ve done a lot to fix sequencing issues in key courses (Math’s done this well). Scott and Bramhall note that UO has a variety of programs to target these students. Laura Lee McIntyre asks about how cuts to NTTF will affect advising. Scott: We need to impact advising with what we have, will also need new resources. William Paustian asks about registration holds for students who are behind on payments. It turns out the hold is released when they meet with an advisor. Executive and Audit Committee, 1:30 pm – Thursday, September 7, 2017. Link to materials. 30 minutes is enough for due diligence on all this? 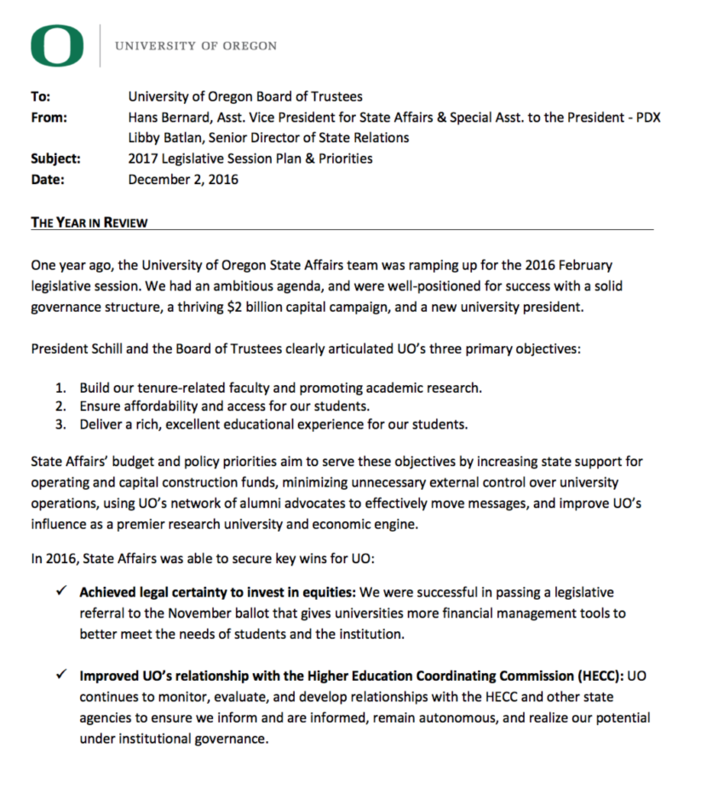 Update: the report is now posted here: https://trustees.uoregon.edu/sites/trustees2.uoregon.edu/files/eac_meeting_notice_agenda_and_materials_090717_w_supp.pdf, towards the end. The gist is that they’ve spent the last year working on a strategic plan, a mission statement, and a vision. 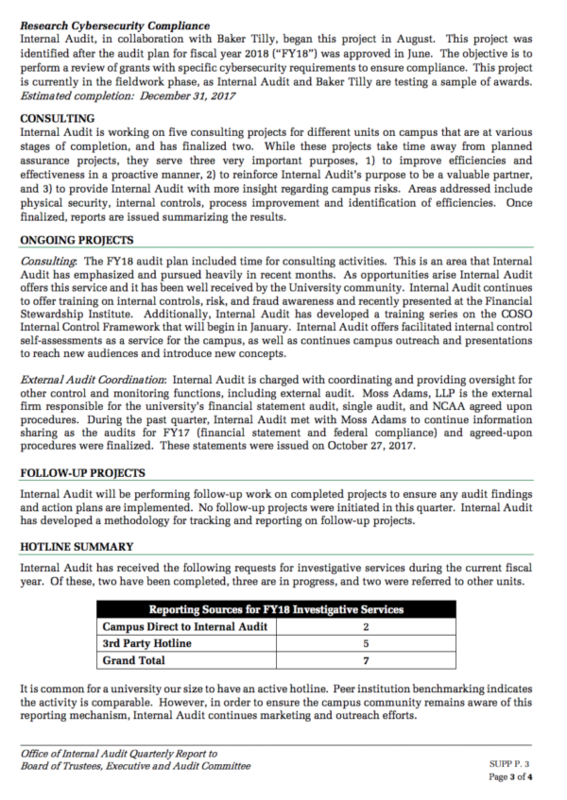 During fiscal year 17 (“FY17”), the Office of Internal Audit (“Internal Audit”) achieved many goals. These included the hiring of two internal auditors; the selection of a partner for the co-source support model; the procurement and implementation of audit management software, including coordination and collaboration with peer institutions using the same software; and evaluation of audit office policies and procedures to ensure compliance with industry standards. We continue to review the audit policies and procedures as the Institute of Internal Auditors (“IIA”) updated its International Professional Practices Framework with new, updated standards effective January 1, 2017. Most significant for the office, a strategic plan was adopted to formally outline steps that will ensure goals are obtained. During this process, the mission statement was updated, and a vision was adopted. President Schill is outstanding – maybe even excellent. 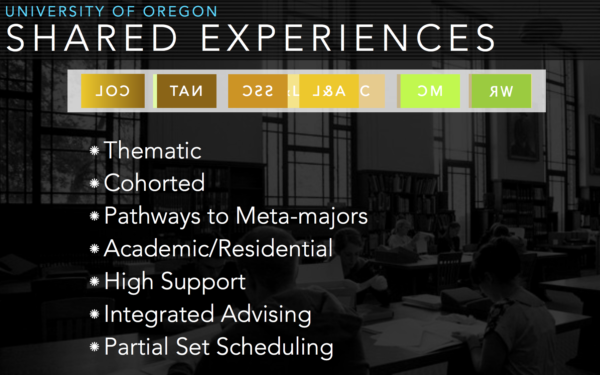 What would really be useful would be a 360 degree evaluation of the UO Board, as the OSU Board does. Finance and Facilities Committee 2:00 p.m. – Thursday, September 7, 2017. Link to materials. Everything seems on track and well managed. Tuition revenue fell about $8M (international students), salary expenditures also fell about $8M, partly due to NTTF layoffs, partly due to delayed hiring. $4.5M in other cuts, so basically “run rate even”. 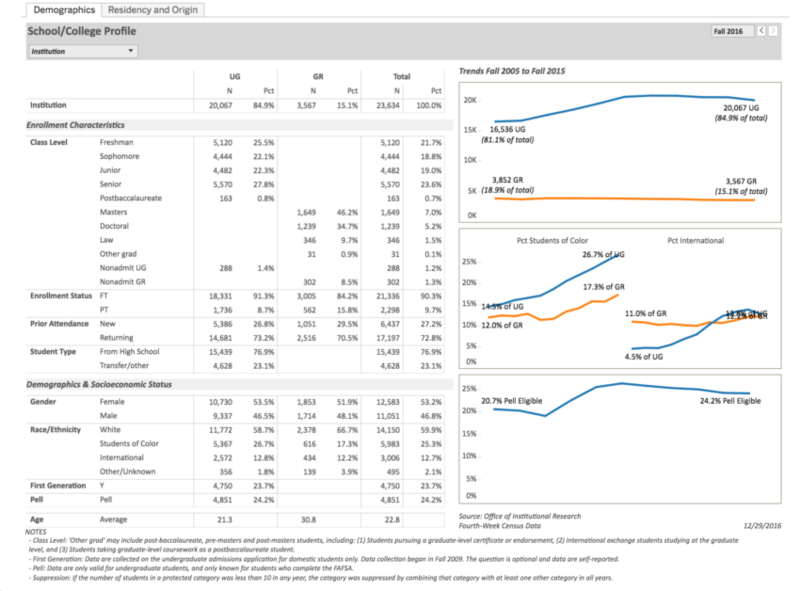 Projections for enrollment look good. 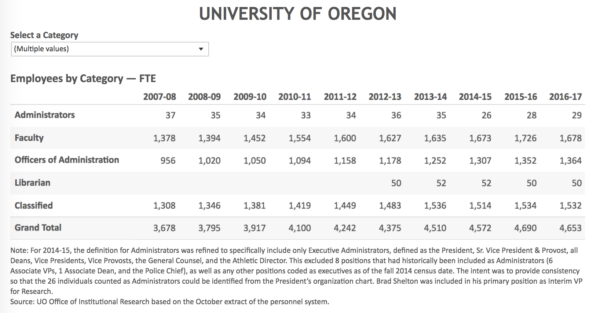 Meanwhile the UO Board of Trustees and its committees typically meet only 4 times a year (maybe one or two extra for the audit committee to approve coaches contracts). Committee meetings are often only 30 minutes. Their next meeting is scheduled Sept 7-8. UO faculty aren’t on contract until Sept 15, and classes don’t start until Sept 25th, but that’s not important compared to the big home game against Nebraska, conveniently scheduled for 1:30PM on the 9th. And people wonder what our Board’s priorities are? Go Ducks! In contrast, the OSU Trustees are willing to show up in Corvallis when they can meet with faculty and students, without a football game to distract them. All sessions in the Ford Alumni Center Giustina Ballroom. The BOT’s hard to navigate website is here. Livecast here. Here’s what you need to know, with handy links. Live-blog if I have time. 8AM: Academic and Student Affairs Committee Materials. That athletics audit has been delayed for 30 months, so far. The previous auditor left, reportedly over a dispute about her independence from the VPFA’s office and her inability to get public records from the administration. And the audit has now shrunk from 300 hours to 120. It’s almost as if the Trustees don’t really want to hear about the “significant risks” and “negative impact of unfortunate events in athletics”. These are on the BOT page as pdf’s here, I’ve reposted them below in more user friendly form. The meetings will be livecast here. [NOTE: This is now the correct link, but last time I checked it didn’t work.] The proposed tuition increases are scheduled for 1:45 or so on Thursday. Live-blogging will be light to none Thursday, so I’ve done a little pre-blogging in italics below. 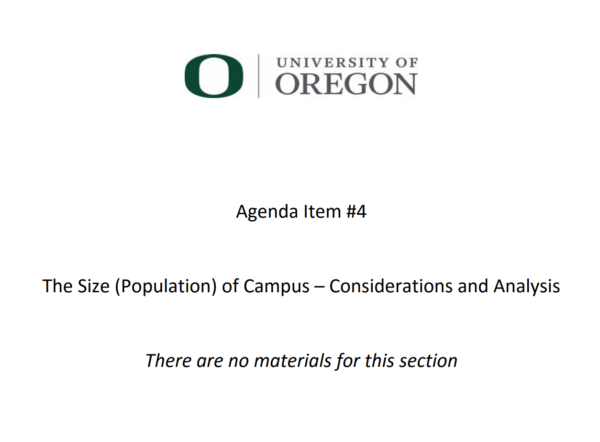 Compare the bare-bones information the UO Board is given with the extensive material the OSU Board receives before their considerably more substantive meetings, here. 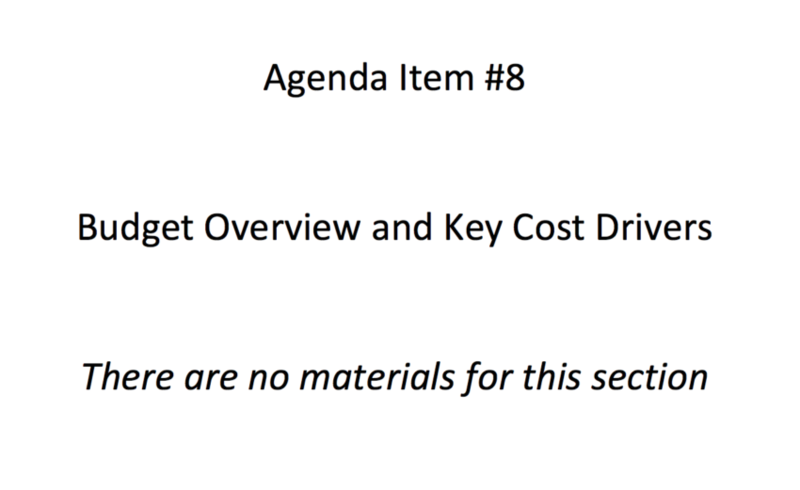 Compare this lack of audit materials with the extensive material the Oregon State Board Audit Committee gets, here. I’m going to have to make a public records request for the athletics stuff. Seems sensible. Leaves more day to day stuff to President. So, 10 minutes to review a $1B budget? that doesn’t even break out the $120M in athletics expenses? WTF? Any quick questions? No? Meeting adjourned. Will they throw free speech a bone this time? Chill, Ron’s got this covered. Quinn gave her usual excellent presentation, with lucid commentary. The 2015-16 audited financial statements are finally posted here, with past statements here. Spending on Instruction is up 9% over 3 years, spending on research is down, spending on Institutional Support (i.e. administration) is up 17%. 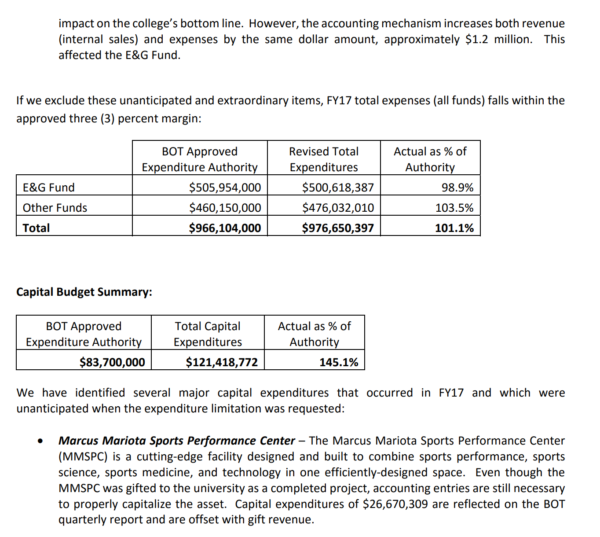 Despite previous requests from the board, UO is still not breaking out Athletics in these operating cost reports. Sorry, missed most of this. Passes on a voice vote with no discussion. Agreement to settle UO’s $42M lawsuit against the construction companies over shoddy construction of the Global Scholars Hall. UO gets $6M in work to fix the buildings over 3 years, so it will be ready for the IAAF, plus $1M to pay for UO’s external lawyers. I thought there was some cash involved too, but maybe I’m wrong. Passes on a voice vote. No discussion of Ron Lovinger’s idea about moving Franklin Blvd back along the railroad tracks to allow for joining the Knight Campus to the regular campus. New Black Cultural Center to be constructed near Hayward Field. Many other new construction and renovation projects. Unfortunately there don’t seem to be any plans to tear down PLC or Collier house. Of course not. Wouldn’t want the Trustees to have this in advance – they might ask informed questions. 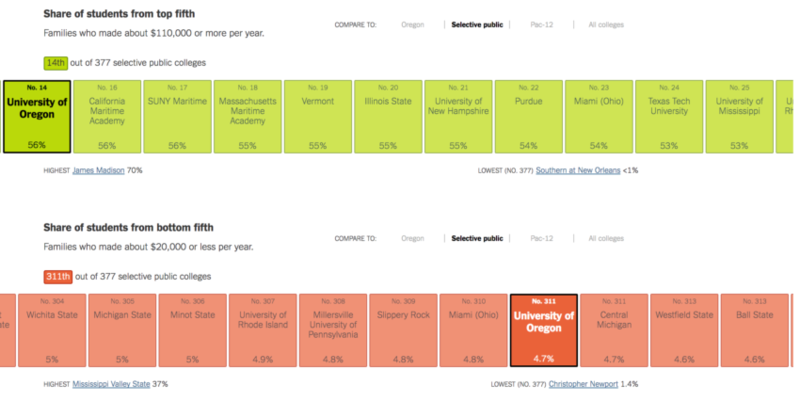 Moffitt & Schill explain that out-of state tuition is at market, but there’s still room to increase in-state tuition. 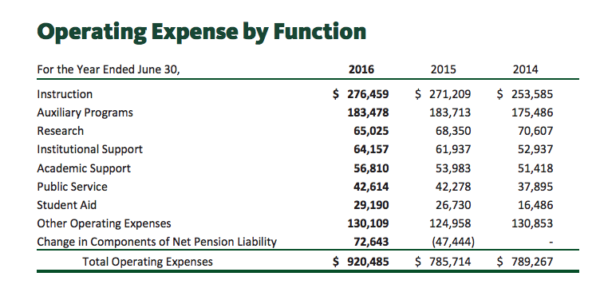 UO has increased spending on tuition discounts, much of it for in-state tuition, and the Governor’s budget also projects more state funding for financial aid for low income students. So my take is that increases in the posted tuition price will *not* mean increases of the same magnitude for our low SES students. Moffitt talks about how the administration gives itself raises according to the same scale that the faculty union negotiates. Why? She also says that the union contract includes promotional raises that the administrators don’t get, but she’s obfuscating: OA’s get promotions and new job titles, and raises to go along with them. How big? I don’t know, but administrative spending us up 23% over 3 years. Schill asks abut Title IX costs. $1M a year? Moffitt explains that it’s hard to calculate, but yes costs and hiring have gone up. Not to mention how much money we’re paying to cover for Penny Daugherty’s AAEO office mistakes. 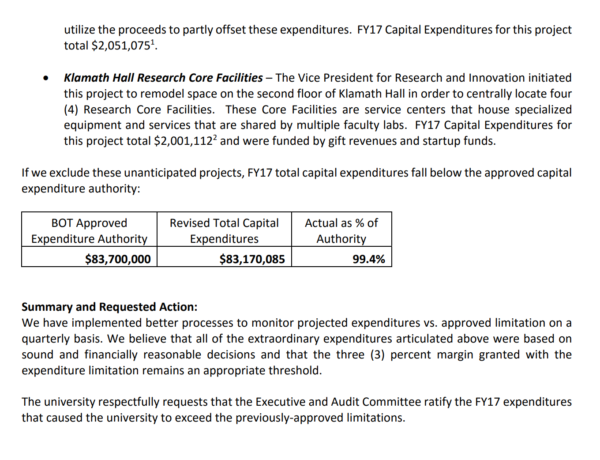 Lillis asks Moffitt to prepare a summary of these costs. Bottom line is that Moffitt is predicting a 5% increase in UO’s “Education and General” costs for 2017-18, on a base of about $500M. Moffitt and Schill tell the board that UO’s administrative staffing is below our AAU peers. Of course so is our faculty staffing. 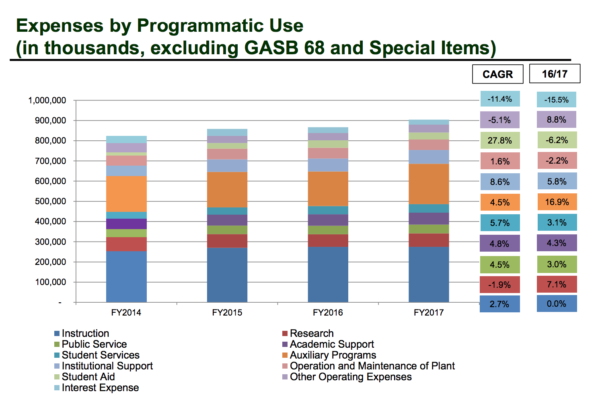 Obviously there are many places UO can cut administrative spending and also some places where we need to spend more – despite the 23% increase over the past 3 years. The board has not been give anywhere near enough information to have an informed discussion on this. Schill notes that the Knight Campus will allow UO to recruit more top Oregon students to do science. Governor agreed to fund the $100M asked for the Knight Campus over 3 biennia. 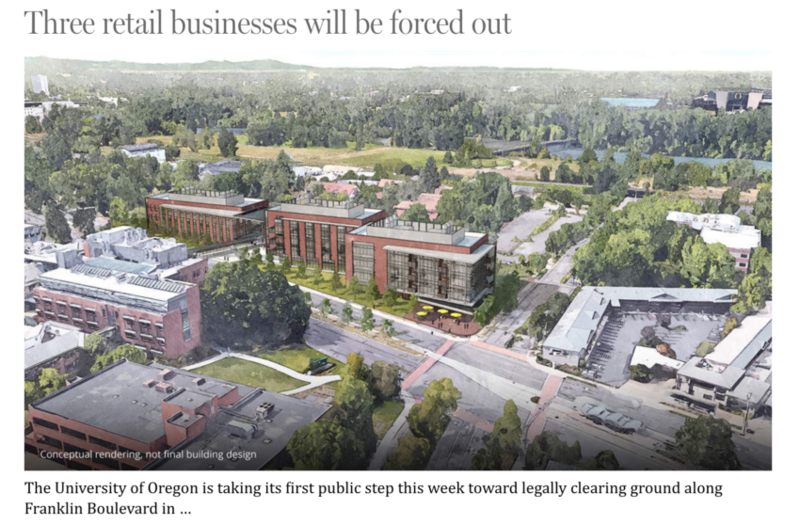 UO is going to try and accelerate that. Patrick Phillips does a great job explaining why the campus is excited about this – more research, more good students – and why it will be good for the state. Schill gives the Senate a shout-out for its enthusiasm and support for helping implement this project. Willcox asks if the Campus Planning Committee will be involved. Moffitt: Sort of. They’ve been briefed, and are supportive. Ginevra Ralph notes that UO should collaborate more with local businesses to help solve the spousal hire issues that UO currently faces, and which will need to be better addressed in order to hire all these new faculty. 12:17PM: Meeting adjourns, then subcommittee reconvenes to approve the GIS programs left over from yesterday. Oregon Opportunity Grants, aimed at helping the state’s neediest post-secondary students, are expanded in Brown’s budget, with an aim of providing financial assistance to an additional 5,000 students. She has also chosen to preserve the Oregon Promise program, which lets high school students with high enough grades attend one of the state’s nine community colleges for as little as $50 per semester. Funding for community colleges and higher education, meanwhile, would contain no built-in cost for maintaining current service levels. On the other hand, the governor has proposed spending $350 million to help with facilities projects at the state’s colleges and universities. 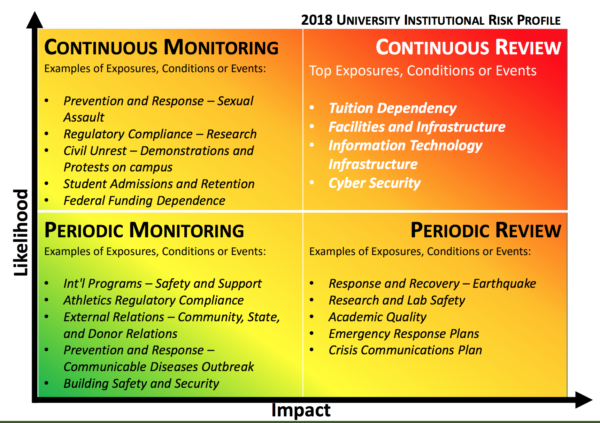 That effort includes $15 million in bonding money for campus security upgrades in the wake of the October 2015 shootings at Roseburg’s Umpqua Community College. · The Governor recommends flat funding for universities. 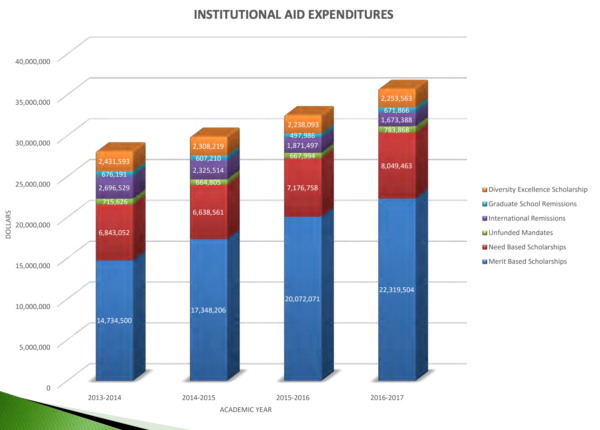 The Public University Support Fund (PUSF) is funded at the Legislative Approved Budget (LAB) 2015 level of $667.3 million). Because of the current service level calculations and the technical details on how funds are split over the biennium (49% in the first year, 51% in the second). this does represent a modest cut to UO. While we will need to manage a slight cut in state support and account for significant cost increases amounting to nearly $25 million in the coming year – the Governor went to great lengths to shield public universities and students from taking a disproportionate cut. · The Governor increased funding for the Oregon Opportunity Grant by approximately 8% from last biennium, bringing the total funding amount to $151 million. 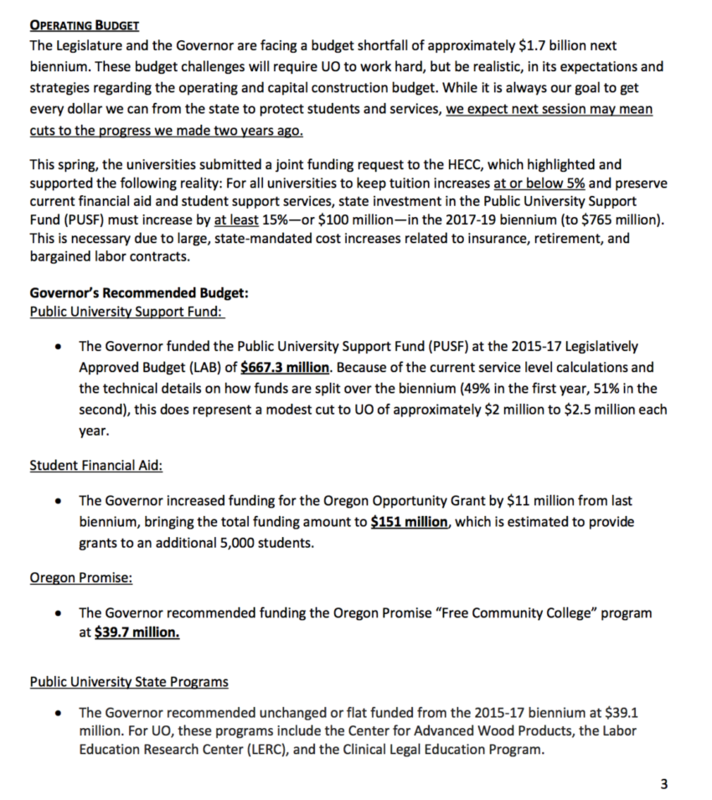 · The Governor’s Budget recommends funding the Oregon Promise “Free Community College” program at $39.7 million. The proposed budget includes approximately $275 million in funding for university Capital construction projects. 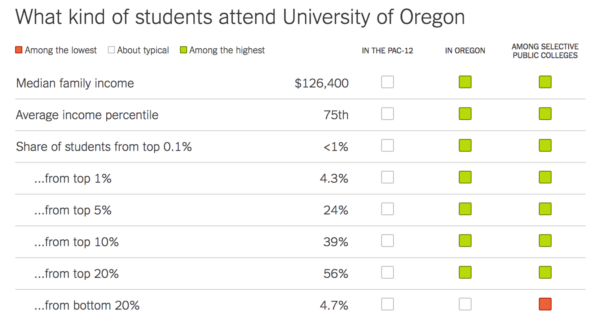 The largest slices of the pie are given to UO ($77 million), OSU ($47 million), PSU ($40 million) and OIT ($38 million). The budget also recommends funding for $75 million in community college projects. Classroom and Faculty Office Building: The Governor’s budget provides $44 million for UO’s Classroom and Faculty Office Building. The project UO submitted to the HECC included funding to renovate faculty offices once the new building was constructed. The Governor’s budget does not provide funding for those portions of the project ($11 million). Knight Campus for Accelerating Scientific Impact: The Governor’s budget supports full funding for the Knight Campus, with the investment made over the course of three biennia. An initial investment of $33 million is included in the 2017-19 budget. Again, I will provide you a more thorough update in the coming days. Please don’t hesitate to contact me with any questions you may have. Live webcast on BOT meeting here. Some live-blogging below. The official BOT website buries the agenda, so here’s an easier version. Haven’t had time to look into the materials much, but I did notice Chuck Lillis and Ginevra Ralph have no competition for their elected Chair and Vice Chair positions. 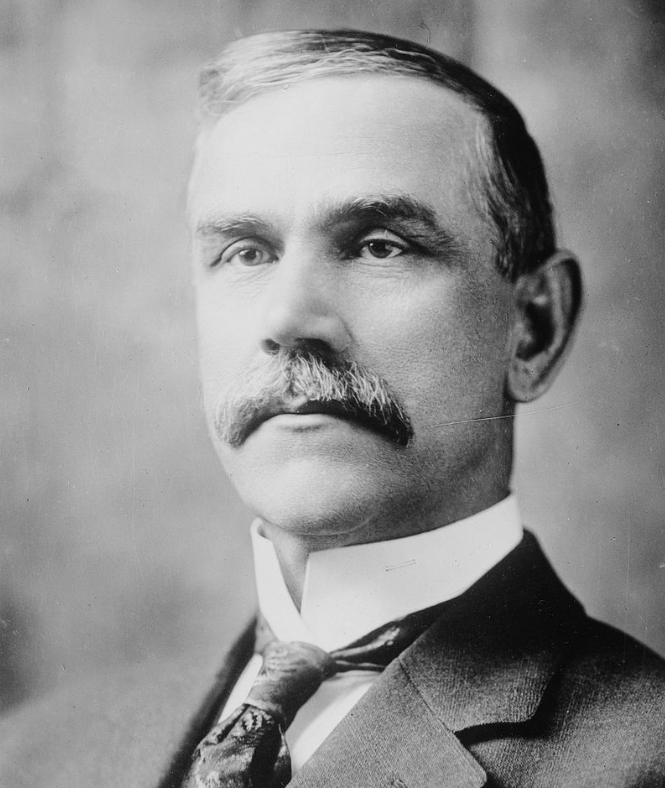 (Last year Lillis presided over the meeting that extended his own term from 2 years to 3.) I note that the UO Senate generaly is able to field competitive slates for these kinds of jobs. And where are the internal audit reports? Sorry, there’s not enough coffee in Portland to get me up early enough to sit through Scott’s powerpoint again. Rumor down at Cafe Roma is that about 15 IT people have left so far or are leaving. There are 12 open IT jobs, including the director position, posted on the HR website. Moral is low. Not in the packet. How can the board do due diligence with this? Angela passed out packets at the meeting, but there weren’t emugh for the 5 visitors. Presumably it’ll be online soon. The auditor’s report is that all’s well from the from the 40,000 foot level. UO has been independent from the state’s Audit Board for 3-4 years now. It took a year to hire the first auditor. She left in frustration after a year or so. So did a couple of her staff. That was a year ago. Our new auditor has just staffed out her office and put up a webpage. 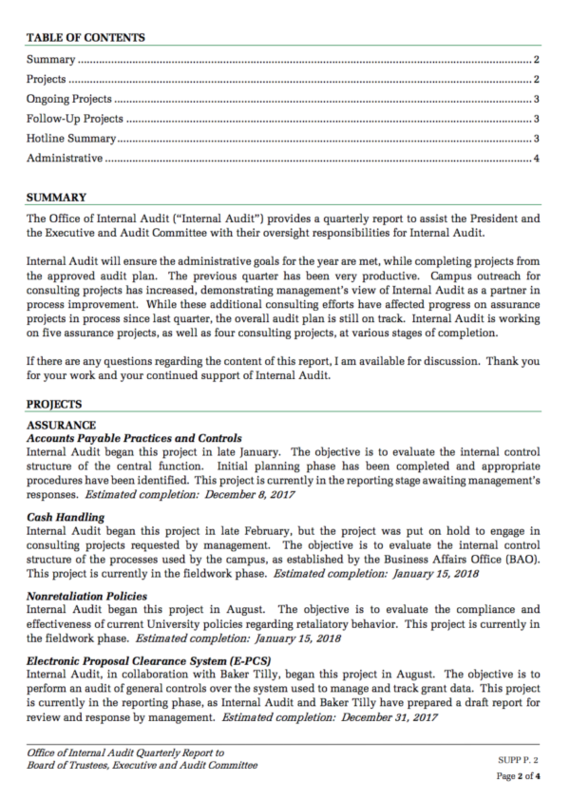 Someday they may actually start doing internal audits, such as the long promised athletics audit. While the state regularly published their audits of UO, I’m guessing it’s going to be a long public records battle to get these from the PRO. Lots of colorful powerpoint slides. LeDuc’s empire seems to have expanded from security and digging faculty out of the rubble of PLC, to consideration of isssues like IT security, tuition dependancy, grant administration. Not sure where the athletics lawsuits and Halloween parties fit in. Wants to buy more insurance and water filtration systems. Lillis asks Moffitt if UO has a list of “unfunded mandates” from the feds for UO. This idea presumably comes out of his support for erstwhile Presidental Candidate and higher-ed crank Ben Carson. Moffitt: There was a report coming out of some east coast school listing these mandates and claiming they were a major driver of administrative bloat, but it was problematic. This is a proposal to invest UO’s medium term funds with the UO Foundation, in stocks and derivatives, for hedging not speculation. It was passed as a ballot inititiative this fall. Very sensible, Lavear knows her stuff. Kurt Willcox asks what sort of oversight the board will have, and what sort of information the notoriously secretive UO Foundation will share with the Board. Jay Namyet, UOF CIO, says not much. This is a trust me proposal, but imho I trust Lavear’s judgement on this and her ability to keep an eye on Namyet. Ann Curry asks more skeptical questions. Ross Kari does a good job addressing them, notes that after the last financial meltdown there are now more SEC rules regarding transparency and reserve requirements. Jay Namyet notes that the UOF insists on dealing with managers who have their own net worth in the fund, and they insist on complete transparency. Good practices – but not ones the Foundation follows for its own employees. Lillis notes that Namyet has had a spectacular 10 years in terms of investment returns. Susan Gary: Is it worth it for UO to pay the LEED people to certify buildings as energy efficient. Can’t we just build them that way and save the money? Harwood: probably worth paying for the LEED stamp of approval, for public relations. Frankly, it’s a little odd to hear so much discussion of energy audits, and so little of internal financial audits from the board. Diane Dietz has the story here. Reed makes clear he is taking his responsibility to comply with the Constiution’s taking clause very seriously, with the help of some Portland lawyer. Lets hope he takes to university’s obligation to comply with the First Amendment, when it comes to our student-reporters, student-athletes, and Divest UO and other protestors just as seriously. Ann Curry give the RG’s Diane Dietz a shout out over her story on who this will affect the tenants. The Jock Box’s athlete-only parking lot will be untouched, of course. Moffitt notes that all the funds for relocation etc., will come from the Knight gift. Full disclosure: I’ve been working with Darci Heroy for 6 months on the Senate’s successful effort to replace the administration’s mandatory reporting policy with a student-centered policy, and I think she’s very sensible, effective, and committed to reducing campus sexual assault – not trying to cover it up, as has been UO’s unfortunate history. She shows the board the new safe.uoregon.edu website, which has fixed many of the problems with famously incompetent AAEO Directo Penny Daugherty’s unnavigable and factually inaccurate website. It’s no surprise that the administration has never put Daugherty in front of the Board. Heroy goes on to give some history on Title IX, explains that the pendulum is shifting back towards increased rights and more legal action for the accused. Confident that our processes to a good job of blancing the rights of the victim and the accused. Pres Schill asks Reed about how many lawsuits we have at the moment. Austine et al., and 2 others (?). Heroy notes that the lawsuits have helped improve UO’s internal processes. She wants UO to be consistent in following the focus of Title IX on making sure that all of our students have access to a fair and compassionate process, one that will make sure they all have equal rights to accessing education. Ginevra Ralph asks why universities are required to handle sexual assault differently than, say, murder. Heroy explains that’s because of the focus of title IX on equal access to education. It does put us in an awkward place, we must have a sort of ghost criminal process. Reed agrees. Ralph follows up, asking about the basketball allegations. Why were we required to investigate, rather than give it to the police? Reed: The police often inestigate as well, but civil rights law holds us to a higher standard because of our obligation to provide equal access to education. Reed & Schill: Criminal process has a higher burden of proof, is invasive, public, students don’t use it. We need to protect them anyway. Heroy gives a shout-out to the Senate RRWG and it’s new policy. Talks about how campus is now working in sync on issues of sexual assault prevention. Very good discussion between Heroy and the Board. Sorry, not much live blogging. Check the video. Several public comments calling for more building energy efficiency efforts. Several pointing out the problems with the IT reorganization effort and its thus far negative effect on it personnel and services. Several comments from owners and leasors of the land UO is negotiating to buy, all building the arguent that their property and investments are worth more than the appraised value. According to the Domino’s owner, our General Counsel stepped in the deep-dish with his RG comments. Two portland students comment on the Halloween “black-face” incident. Appreciate Schill’s statement. Embarassed by the professor’s actions. Want more university resources in Portland for students to talk about incidents like this. Lot of buzzwords, shiny video. Still no news on the $20M donation we were told would fund this spire of excellence. These are not easy to find on the Board’s website, so I’ve put them here. Schedule and links. Each link below takes you to a post with the respective committee agenda, documents, summary and sometimes some commentary. The full board agenda and materials and some live-blogging are at the bottom. – Call to order, roll call, verification of quorum – Approval of June 2016 minutes (Action) – Public comment. Those wishing to provide comment must sign up advance and review the public comment guidelines either online (http://trustees.uoregon.edu/meetings) or at the check-in table at the meeting. Jim Igl: He has provided written documents to the board. He is skeptical of the Historians’ Report’s section on Dunn, and argues that his connection to the KKK was tenuous and short lived. He notes that Dunn was a life-long member of a Methodist church that was famous for its eucemenical nature, not anti-catholicism. He also brings up Dunn’s family connection to Abraham Lincoln. [I don’t know Mr. Igl, but I want to thank him for stepping up to tell us more about Dunn. As President Schill later noted, the dead cannot speak for themselves, and everyone deserves an advocate. It was a brave move, which I imagine will cost Mr. Igl some grief even though there was nothing in his remarks to suggest that he has anything but disgust for the KKK, racism, or religious intolerance. Quite the opposite. ASUO VP Natalie (sorry, missed last name). Supports denaming Dunn and Deady. believes majority of students do as well. ASUO Pres Quinn Hagga: Supports denaming Dunn and Deady, calls for an investigation of the names of all other campus buildings. Chuck Lillis: We’re here to decide about Dunn, not Dealy, or Healy, or whoever he was. Oh, Deady. OK.
Pres Schill: Serious decision, those up for denaming are not here to defend themselves. Strongly believes that racism and bigotry have no place at a university. Dunn was the Grand Cyclops of the KKK, a terrorist organization that promoting lynching. Recommends Dunn Hall be denamed today, and then renamed for someone whose life does represent our values, after an open, campus-wide process. Thanks the Black Students for raising this issue, believes that the process they started has benefited us all. Trustee Andrew Colas gives a very effective speech on why he supports denaming Dunn now, and also Schill’s decision to delay dealing with Deady until the students are back. I’m not going to try and summarize it, I hope the Board posts the video soon. Frederic S. Dunn is denamed by unanimous vote of the Board. Dunn was also a member of the YMCA and a freemason, but he is not buried in Eugene’s Masonic Cemetery with his parents, or in their fabulous Mausoleum. Someone needs to hire HLGR to work on this conspiracy. More Dunn trivia: The YMCA sent him to Italy to work with US soldiers after WWI. What sort of classics professor comes back from a trip to Italy hating Catholics? Allyn Ford recuses himself from the vote, because he’s giving the money for this. Pretty sweet, and the board cracks up. Sorry, I got sucked down the Dunn history hole. Provost Coltrane introduces President Schill’s many recent hires. They all sound good from where I’m sitting. Schill gives Coltrane full credit for hiring them. Pres Schill discusses how much UO has improved in the past year. Agreed. He then goes on to discuss how he is meeting the remaining demands of the Black Student task force and how UO is trying to meet them. Frankly, some of this stuff sounds illegal given past court rulings, but then I’m not a lawyer. $1.05B in fundraising so far. In the past year *80%* has been for academics. As Schill notes, this is a turnaround. Lots of uncertainty about next biennium, particularly if Measure 97 fails. If it does, we will need double digit tuition increases and spending cuts. 3:25PM: Lillis recesses for a private “training session” with the Board. Uh-Oh, last time this happened they decided to subsidize Tracktown’s IAAF championship bid.